Tatiana Serjan’s Abigaille commands the Babylonians—and the Lyric Opera stage—in Verdi’s Nabucco. When the curtain closed on the final scene of Nabucco, now playing at Lyric Opera of Chicago, there was the semblance of a happy ending: good triumphed over evil, love over hate, salvation over paganism. However, this seemingly perfect finale was tinged with uncertainty. The last image featured the villainess Abigaille, lying dead at the feet of her virtuous sister Fenena. Yet Abigaille, for all her hate, arrogance, and paganism, was cloaked in innocent white; Fenena was draped entirely in black. The final costuming of these two women blurs the conventional understanding of good and evil, forcing the audience to reconsider the motivations and development of both characters. Nabucco, written in 1841, was the opera that launched Giuseppe Verdi’s career. Based on biblical stories from the Book of Jeremiah and the Book of Daniel, it recounts how the Babylonian King Nebuchadnezzar—translated as Nabucco in Italian—conquered Israel and exiled the Jews from their homeland. 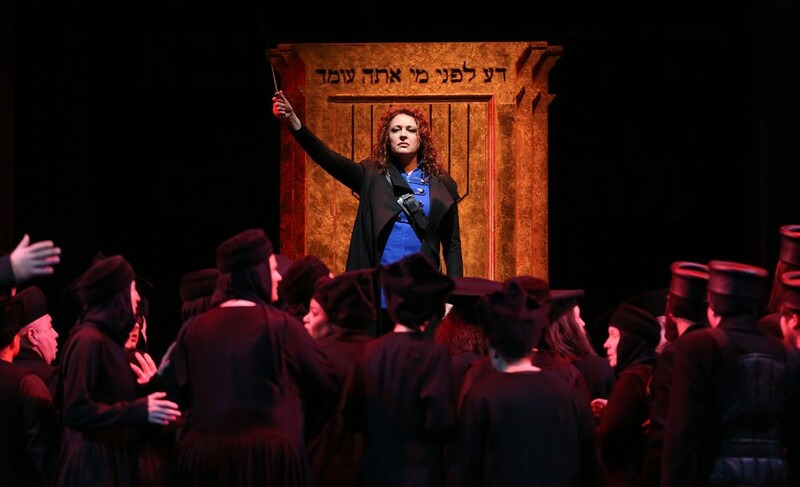 Nabucco is renowned for its choral numbers, and the Lyric Opera Chorus, directed by Michael Black, did not disappoint. In an opera concerned with the power of both men and God, the booming voices resounding through the theater achieved the intended sense of awe. However, Nabucco’s most celebrated chorus of Hebrew slaves, “Va, pensiero” did not make as deep an impression as I had hoped. Baritone Željko Lucic—while good as the brash, egotistical King Nabucco in the first two acts—excelled in the second half as a vulnerable old man and distraught father. The more Nabucco’s arrogance battled with his soul and his pride battled with his love, the more Lucic rose to the occasion, turning out a convincing and moving performance. However, the true star of the night was Tatiana Serjan, playing the role of Abigaille, Nabucco’s fiery, power-hungry eldest daughter. Her voice was arresting, and her range incredible. She commanded the stage and, at some point or another, almost all the other characters. In a male-dominated society, she came on stage dressed in a long cloak and pants with her sword drawn, flanked by a legion of soldiers. In comparison to the cloistered women in the Temple of Solomon and her modestly-dressed sister Fenena (played by Elizabeth DeShong), Abigaille was a burst of female strength and confidence. I was slightly disappointed when she came back on in Act II wearing a dress. King Nabucco’s evolution through the opera is clear. Through trials of the heart and mind, he transforms from an arrogant king who believed himself better than God to a humble man who finds faith and saves both his daughter Fenena and the Jewish people. But the character developments of the daughters are not so straightforward. Like Abigaille, Fenena was also designed to be a strong character, and the production should have done more to highlight this strength. She defies her father on multiple occasions, leaves her family and pagan religion to convert to Judaism (arguably for no other reason than to be with her love Ismaele), and opposes Abigaille when she takes control of the crown. From the Babylonian perspective, Fenena is the dissenter and Abigaille the one preserving the interests of the empire. Although ambitious, Abigaille is the only sane one in the family; based on their actions, it seems less likely for Abigaille to be blinded by hatred than Fenena by love. Abigaille dies by her own hand after wishing happiness to her sister. The truest words are the ones that come in the moment before death. So who is good, and who is evil? Both and neither; all are human.